Discussion in 'Muppet Headlines' started by Phillip, Feb 4, 2004. Should Henson get more involved with Disney? Poll closed May 4, 2004. Bean here. Over at www.miceage.com, Al Lutz is reporting that the Muppets are starting to appear in California Adventure. hmmm. "Isaac Martin spotted a Miss Piggy walkabout at California Adventure. It was rumored after the Pixar fiasco that Disney will now refocus on what Henson properties it now has, and look to expand the relationship again." I think they should wait it out until Eisner is kicked to the curb. I feel the partnership could breathe new life into the Muppets (projectwise) if properly handled. I agree.I think disney and the muppets are good for each other and i've enjoyed their collaborations in the past...but youre right , wait until eisners outta there. And any one who owns shares should go to the share holders meeting to make sure that happens. Yes, Disney and Henson should expand their relationship. Disney has had a bigger interest in the Muppets than anyone else, and Henson NEEDS a partner so they can get back on track. As for Eisner, I am not anti-Eisner, but he just needs to go. I think he has just lost his way in the past few years and the Disney Company needs new leadership before their reputation gets any worse. AMEN! The Muppets, and the Jim Henson Company in general, needs one single outlet for their TV programming and movies. Disney is perfect. Since Pixar is not under the Disney umbrella anymore, I think Henson is a perfect replacement. Personally, I think Pixar is making a huge mistake by not continuing with the juggernaut that is Disney promotions. Look at what it got them: Big Box Office returns, promotional deals such as Disney on Ice, Disney Store, Disney Channel, ABC, Video Games, etc...Where else are you going to find that kind of a juggernaut that has a fan base that will buy anything Disney? Nowhere. Henson is walking into a great situation. I think they'll recover and make lots of money off of this. I particularly love the visual of Eisner being kicked to the curb, perhaps left sitting there next to his Mercedes. Or Bentley. Whatever it is he drives. I think they should go for it, now might not be the best time for Disney but I don't really see this effecting the Muppets. Although I wouldn't want Disney to buy the Muppet I still wouldn't mind a partnership of some kind. I completely agree, just look at what Disney and Henson have done for each other in the past...BEAR FOR 1!!! 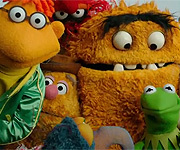 hopefully Disney will be a big help in getting muppet movies back on the big screen where they belong, and Henson will bring much needed originality and life back to the Walt Disney company. I agree with Boyraisin - and i don't mind whether they are Eisnerless or not. The pairing is obviously much needed - Henson can't afford right now for any project not to do well and one slip up could make them toast. Putting Disney in the mix (although with a Pixar type deal - not ownership) will give them the freedom to try new things and more opportunity to use what they've got. I think Disney, as with Sony, Time Warner, etc, is a faceless corporation out for money, and Henson can do no good teaming up with them. It's sad to think that the creative genius of Henson is reliant on the finacial support of larger business, only because said business have squashed out any competeing smaller businesses. Companies like Disney (and their cheap $$-grubbing tactics) are the reason that companies like Henson are struggling. Yeah there's something about that picture isn't there? Heather, Lisa, John and Cheryl all look like they're having fun but its a shame Brian Henson didn't turn up for the photocall! oh wow my two favorite websites are talkin about my 2 fave topics. yay. i think henson really needs this right now. i mean yeah with the monumental success of their food commercials Hensons rollin' in the dough. ::sarcasm::. but this could really bring them back to the spotlight. we've already seen how much disney can do for something such as 'a bugs land' for Pixar's "a bugs life." could you imagine what they could do for the muppets? it would be a dream come true to have anything near to that for kermit and co. (minus the devotion to kiddie rides) the real question is Can it happen? can disney and henson finally work out a plan that would suit the both of them? i think we'll all have to see at this point, but i would be 99% behind them if they choose to give it another shot. Did that picture come form "Here Come The Muppets" that used to be at the Disney MGM Studio? If so, do have more picutres? I was at opening day for "Here Come Muppets" and the "Ninja Turtles" at the Disney MGM Studio way back in 1990. I took some pictures but they didn't turn out to well and that I was young back then. Any who back to the regularly schduled topic. P.S. I believe that an old issue of Mickey Mouse Magazine from 1989 or 1990 had a huge artilce about the Muppet coming to Disney. There was even a comic in the magazine with both Disney and Muppets character interacting. I will try to see if I can find it. Please do, Bean. Please do. I just wonder if this will be IT. Could Disney and Henson finally have some sort of partnership which we have been speculating about for the past many years??? I really hope that Henson and Disney can have a great working relationship. While there are +'s and -'s to working with Disney, I really would like to see the Muppets have more of a presence at the Disney theme parks. I absolutely love MuppetVision 3D and I loved Here Come the Muppets Live Stageshow when they did that. The waiting area was so cool. Bear in the Big Blue House is a great success. They have media outlets that can give them exposure. 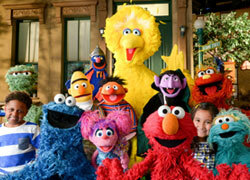 I wonder, with the ABC execs there now, if Muppets Tonight would last if it were on today? They renewed all their new sitcom shows, even It's All Relative. Seems that they want to give programs a shot. I have been very pleased though with Columbia's Henson video releases, like Rocky Mountain Holiday and such. I was very sad to see that Pixar is leaving Disney. Disney has a history and familiarity with public that is comforting. Although they have gotten off track, Disney was a great fit for Pixar's movies and characters. They got life in themeparks, spinoff cartoons, and merchandise. Disney was stupid to let the Muppets and Pixar get away from them in order to save some cash. They will pay for it in the long run. Having worked at Muppet Vision 3D for a few months, I SO would love Disney and the Henson Co. to get back together. Financially, it is a must for both parties. However, Disney cannot control the Muppets. Murge, but don't kill the creativity.